Computer-Hacking Online Poker Chip Thief Gets Two Years in Prison! A gifted computer hacker who stole £7.4million worth of online gambling chips has been jailed for more than two years. Ashley Mitchell (pictured right), 29, of Little Park Road, Paignton, broke into the system belonging to American gaming giants Zynga Corporation and stole 400 billion chips. He then set up profiles on the social networking site Facebook and sold some of the chips for a black market value of £53,000. The court was told Mitchell was a determined offender who researched hacking on the internet in order to cheat the company. When Zynga installed upgrades to block him he adapted his methods to beat them. 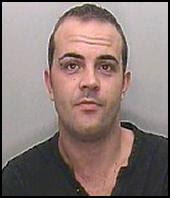 His actions triggered a global hunt by the company for the hacker responsible which ended in Paignton. The court was told Zynga.com, a web-based company with its headquarters in San Francisco, operates via social networking sites such as Facebook. Users initially receive 1,000 free chips to play online games such as Mario Brothers, Mafia Wars and poker. Prosecutor James Taghdissian said in August 2009 the company became aware of some sort of infiltration to its system, which catered for 45 to 50 million poker players. The company tracked the problem to two employees in San Francisco who were investigated but cleared of doing anything wrong. It later turned out that Mitchell had used a computer hacking programme available on the internet to assume their identities and used them to credit his own account with chips. He would then sell the chips to others for profit. Mr Taghdissian said the company 'narrowed down the hack to the Paignton area'. Mitchell was tracked down because on one occasion he had used his own Facebook profile to hack into the system. After a lengthy investigation he was arrested by police in September 2009. He told police he was responsible for the accessing the system after using the internet search engine Google to learn about hacking. Mr Taghdissian said Mitchell made a 'determined and repeated effort to attack Zynga's system' in order to obtain chips and sell them for profit to online gamers. He used some of the money to pay for expensive items such as Rolex watches and to fund a gambling addiction. He sold around one third of the 400 billion virtual poker chips he stole. If he had managed to sell them all his total profit would have been about £184,000. The court was told the difficulty in valuing the chips was because they only existed in the online world. But if Zynga Corp had sold them legitimately the value would have been $12 million, the equivalent of £7.4million. The court was told that in 2008 Mitchell defrauded his former employers at Torbay Council of £3,498 after hacking into their system and changing personal details. He was given a 40-week suspended sentence. Mitigating, Ben Darby, said the father-of-one deeply regretted bringing shame on his family and had since set up an online gaming business of his own which was successful enough to allow him pay Zynga compensation. "At the time he was suffering from a gambling addiction," he added. Judge Philip Wassall told Mitchell that although he targeted a rich multi-national company his actions undermined public confidence in other computer systems run by businesses. He said: "You used a considerable degree of expertise and persistence through software you purchased to hack into the computer system. The means of gaining access to it shows to me and elaborate and extensive research." Mitchell, who also asked for 41 related offences to be taken into consideration, was given a two year sentence for the hacking and fraud offences. He received another 30 weeks for breaching the suspended sentence. What's With This Big Casino Cheating Secret in Saskatchewan? The other day I reported on the arrests of a casino dealer and six players at the Gold Eagle Casino in North Battleford, Saskatchewan, Canada. According to the Royal Canadian Mounted Police and the Saskatchewan Indian Gaming Authority, this insider dealer cheat scam went on for some two years, as long as the investigation. However, neither agency would release details about what the casino-cheat scam was or how it worked. I am assuming it was nothing new, probably a run-of-the-mill-over-pay-the-player blackjack scam, or at best some type of false-shuffle scam (if the casino indeed has a baccarat table). But why are the authorities so mum on this? The chances of some big sophisticated casino cheating scam happening in this very unimpressive casino are almost nil. I would guess that the reason for this silence is nothing more than the casino's and the Gaming Authority's embarrassment over not having caught on to this scam earlier. Until I hear impressive details, that is what I will continue to think. In any case, just take a look at this place. It looks like a grind joint! Dealer and Six Cohorts Busted For Cheating Canadian Casino--Another Inside Casino Cheating Scam! This time it's the Gold Eagle casino in North Battleford, Saskatchewan, and by looking at the photo of the place, you can see it's a barn at best. Anyhow, seven people are charged with cheating at gambling, although no details of the scam have been released. It appears to be a blackjack scam, and the Royal Canadian Mounted Police say the arrests of this "Canadian Seven" is the result of a two year investigation--but don't be fooled by that; how much money could anyone get out of this barn even over a two-year period? We do know, however, the amount cheated out of the casino surpasses $5,000, stated by the felony charges agaisnt the accused. The dealer and his cheating buddies have been banned from all Saskatchewan Indian Gaming Authority casinos. When I get more on this I will pass it on.